Man in United States Army uniform stands next to three men on gravel area in front of barracks at Rohwer concentration camp, Rohwer, Arkansas, August 20, 1944. Man in a white t-shirt and graying hair stands with proper left hand in pocket. Tall man in white t-shirt and cuffed jeans has two bandaged fingers on his proper right hand and stands next to man military uniform of light colored slacks, long sleeved shirt, necktie and garrison cap. 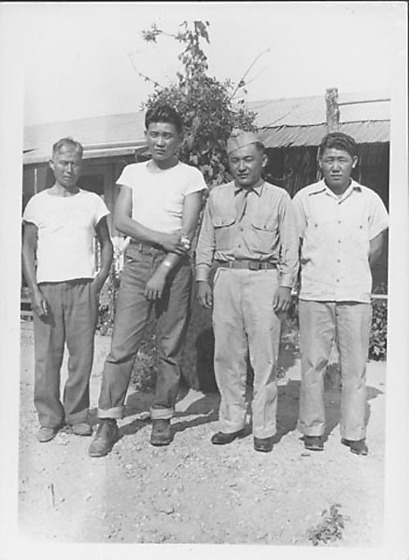 Man at far right wears light colored pants and button-down white shirt. Climbing vine covers post or wire directly behind them. Barracks in background. Same soldier as in 97.292.3E-3K, 3Z. Same image as 97.292.3Z. Stamped in black ink on back: AUG 20 1944.